The staff made sure we had easy to follow directions and the instructions for the cabin were easy to follow and visible. We enjoyed the view at sunrise from the loft, coffee on the porch and the humming birds. We can't think of a favorite thing it was all so much fun. 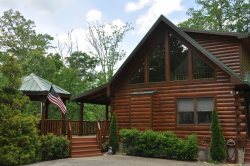 We loved staying at Rocky Ridge at Deep Creek. This has been a very relaxing 3 days. The hot tub was a great way to finish off our days after hiking. The cabin was well equipped and perfect for our family. Kelli did the booking for us when we had a change in last minute plans. Everything and everyone was great. What a fantastic retreat! We greatly appreciate the owners opening up this beautiful cabin to our family. We cannot begin to say thank you enough. We had a great time over here. Nice cabin, great views, hot tub. We slept great and enjoyed our time here. Everyone was helpful, pleasant and knowledgeable. Really enjoyed staying in this cabin. The peace and quiet was amazing we also enjoyed the hot tub with that amazing view.